Next Post Opera Mini not working in Brunei? a friend’s sony ericson G502? Yes I’m taking about you =P And all I remember about the phone was that it was hard to push the buttons.. Sony Ericsson design FAIL! awh… i got use to it. but i keep calling Aaron (cos his name is first in my phonelist). rofl~ too many buttons bah!!!! Since I upgrade my dst simcard to dst 3g, i got problem to get through my internet. I always see the message “Packet Data connection is not available”. Pls assist me on tis matter. I face the same problem with my sony ericsson P1i. Appreciate if someone could help for the setting. Also do check the settings in the application that you downloaded. Some allow you to specify which connection to use for Internet access. Lastly it could be that the networking is disabled for the application. For Nokia, Go to Menu > Installations > Application Manager (App. mgr.) > Select the application you downloaded > Menu > Open. Under “Network Access” make sure it is allowed. Again I’m not sure how it is on other phones but it should be something similar. @erick sorry, but I’m not sure of the settings for Windows Mobile. Tried doing it once and did manage to get it working but seemed a bit convoluted and can’t remember how I exactly did it. which mode of network shall we choose for prima? eversince i upgraded my prima line to 3G dst i came across many times that there is totally no signal if i chose UTMS ( fully 3g signal) but if i choose dual mode, it will automatically search for 3g or d normal line which internet cant be access and mms functions failed. 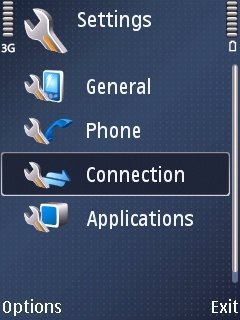 Why is it not a full time 3G signal available for dst prima like bmobile? I’m kinda confuse with telcos from abroad. I’m from Malaysia. Is B-Mobile Communications one of the telcos in Brunei? Thanks for providing this. 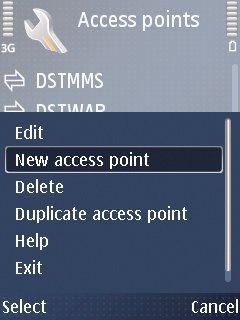 Now I no longer have to go to the mobile shop and ask the people there to configure the settings for me or when I accidentally screw up the settings. I wouldn’t have minded they do it free of charge, though. dst3g????? ?jalan bebatik kilanas.i even ned to go outside house to answer the phone …….very lack of signal…..
how to set up a z6 rokr,s bmobile browser? Can you surf youtube on your phone using a bmobile sim? Like I can surf and all but when I try youtube…clicks on a vid…it says I’m connected and then it just failed to load/buffer. hey. can you give me the settings to wap/internet/gprs to my nokia 6270 . i’m using normal easi simcard. hehe . i’m lazy to go to the shop and ask them to configure it for me. Nokie 6270 . I got problem with my mms setting. My phone is LG KU990. Hoping for your help.. Thanks.. Btw, mine is Bmobile. I’ve tried ur setting up there but it seems not working. And, whats sock btw? Anyone here knows how to set up MMS for iPhone 4? Thanks! I’m not too sure about the settings for the iPhone 4 but I presume it will be similar to the iPhone 3GS. Settings can be found here at AVE Facebook discussion page. Hope this helps! 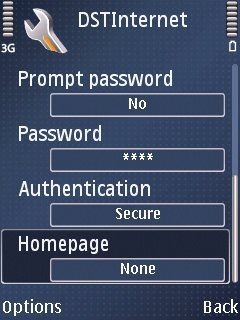 i want to set up internet in my mobile. my sim card is already registered for internet and it is b-mobile sim. my mobile is Genio touch samsung GT-S3650TIAXEO. So if u could help me out…………. Does anyone knows who to set the network connection for LG GM360i. I’m using DST!! aloha..anyone know how to set the internet setting for lg kp500..plz send any info for me at my email. help..tolong..help..anyone know how to set the internet setting n wap setting 4 my lg kp500..plz help me.k tq..
Hi, for HTC Wildfire, can u help me with the APNs setting…tq..
hi .. ive tried setting my mms on my SE S500. there’s this CS and PS thing .. can i know what is that ? ive entered all the other infos .. but im just confused about that part. 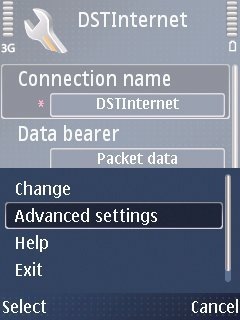 I need help to set my lil sister’s GO!Broadband (Dst broadband) setting. You see I wana use B.mobile line on it coz the B.mobile broadband just wont work with my windows 7. Firstly which modem are you using? I believe the DST modem is locked to Go! and the bmobile modem is locked to Zoom!. The number should still be the same *99# in my experience. i have actually asked a vendor to do the settings for me both internet and mms on my htc wildfire…the internet works fine but the mms doesn’t…what gives? a friend sent me an MMS but whenever i tried to download it…it would either say ‘Message Not Downloaded’ or ‘Generic Network Failure’…what does the latter mean? Sorry I don’t have any experience configuring that. You will have to refer to any manual that came with it and use the settings/values I have provided. It shouldn’t be too difficult. Otherwise I guess you could bring it to the shop that you bought it from and ask for their help. Hello! How do you get the Personal Hotspot on iPhone 4 to work? I tried keying in “dst.internet” under Internet Tethering, but I can’t seem to make it appear. To top it off, it’s the latest firmware. Are there settings for windows mobile 6.1 professional as well? Sorry, I’m not familiar with Windows Mobile settings. Just try to adapt the settings provided above in the appropriate fields. how about sony ericsson W508? can anybody help me..? 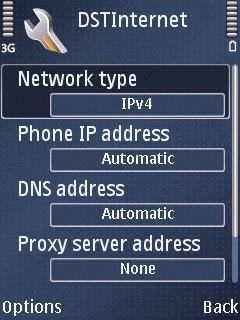 how to configure internet setting for Nokia 2730..Thanks! Hi, Can u help me how to set the dst internet configuration for apple peel 520 gen 2 for ipod touch 4G?? GPRS Settings: We cannot help you with the GPRS Connection settings (they are different for every carrier in the world). Please contact your carrier for more info. 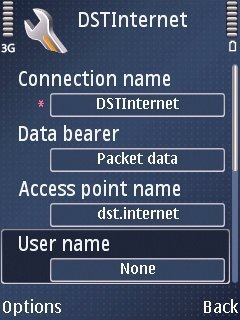 i already use dst.internet on APN.. What i have to fill in Number field? as seen on the screen shot.. 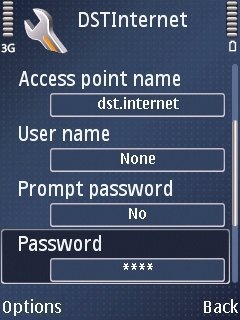 I alreadry configure the phone, I can access internet on my mobile phone (DST network – brunei). I want to use it as modem but I am having trouble on setting it up… I already installed Samsung Kies and samsung networking wizard but unfortunately my PC windows 7 cannot detect the Phone as modem. Transferring files from PC to phone and vice versa are working fine. Basically driver signing was introduced for security reasons and if Samsung didn’t sign their drivers, they are just being cheap. blackberry runs on a separate network. though its dst network, it passes through different channels. you need to upgrade to prima line and avail of the blackberry mobile service which is 25$ a yr. on top of you prima line rental… its quite expensive considering the connection is practically very slow. That is true. Perhaps they don’t want to purchase the service to save the settings in the SIM? Would be perfect for us consumers but sadly no dice yet. So in the meantime we have to manually configure it. 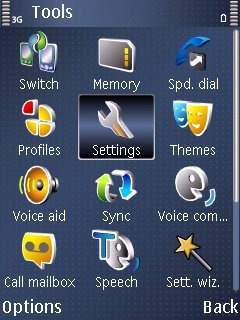 I have problem setting mms for sony ericsson T707. Any help? why the heck is my SG S II losing internet settings every other day. no access to internet for days even. dstinternet, dstmms; nothing.. could it be my SIM? my cousin is using Nokia C2-03,i helped him to configure his access point and so on,but he still cant surf websites by using his cell phone,it seems like the dstinternet aint working at all.Is there any actual configurations for nokia c2-03?the APN should be dst.internet,but what is the packet data access point?He’s using dst sim card,not 3g though. i also have the same problem.i cannot surf or access any internet point while no configuration. 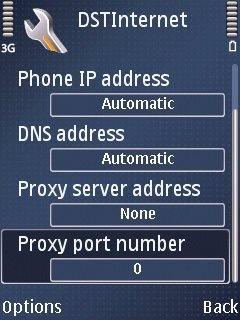 can you help me also to set the internet. while i been searching how to set up the internet. my mum using c2-03. its a troublesome phone. the only great thing is it has dual sims. please HELP! The bmobile settings are specified in the post: bmobilewap as the APN, if not try install my bmobileAPN app on the Android Market and see if that works. Hiya very nice blog!! Man .. Beautiful .. Wonderful .. I will bookmark your web site and take the feeds also?I am glad to find numerous helpful info here in the put up, we need develop extra strategies in this regard, thank you for sharing. . . . . .
thanks muchest! u had helped me set up zoom simm in my galaxy tab to use as hotspot :-))))) vry glad it had worked! May u n fam have a prosperous and safe days ahead. Happy new year! I can’t watch youtube on my N70. It keep giving “define default access point” which i don’t understand which default access point it mean…? Help me with this..
DST internet setting for blackberry 8520 please…. Sadly, I don’t have a Blackberry and thus am not familiar with the settings. 8) In the “Preferred Access Point” option, choose the one you’ve just configured. As I don’t have a Nokia feature phone with me at the moment, I can’t verfiy this, but this sounds very familiar when I did configure feature phones. thanks for the info! initially i tried asking 151 tapi useless. 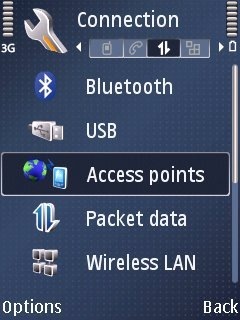 Got any idea how to set blackberry internet data access? Anyone knows how to configure intrnet for ideos google.. I accdntly reset it..Pls help.. I ‘m using b.mobilelilne.. tq v.m..
what is the carrier settings for iphone 5 on b mobile service? how to setup bmobile APN using Android Phone (LG Optimus Black P970?? ?